Polystyrene Beads another great cushion filling. 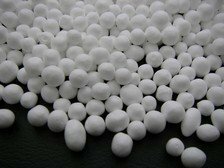 Another versatile filling for cushions is polystyrene beads. These are made up of small pieces of expanded polystyrene, which is widely used in industry for packaging as these will absorb any knocks or scrapes so keeping the item inside the box safe. The most common use for this is for the well known disposable cups, although now plates and bowls are widely used for picnics and outdoor eating. Due to the insulation qualities this filling will reflect your body heat so feel quite warm as well. This can be an added bonus if you have outdoor cushions and seats as this will let you stay outside longer as the evening draws in. This filling is usually used inside beanbags of all sizes and shapes. However if you want any cushion to mould more to your shape, whatever the size, then this filling would be really good. Beanbag type cushions are good for placing on uneven surfaces such as for kneeling pads for outside. If you are making these then you will need to use a strong fabric for the inner pad so any sharp stones do not cut the material, as then you will find the filling all over the garden. This filling is lightweight and can be used in smaller beanbags used to enhance the hand/eye coordination in children or in adults when learning to develop a circus skill like juggling. Manufacturers have another use for these bead filled cushions for the base of a tray. The base then moulds to your knees keeping the tray level. These are usually bought from shops and come in a lot of pretty designs and colours. Over time this filling will need to be replaced as the beads will become crushed with use. Extra filling can be bought from craft shops or other outlets. Cushions or beanbags with polystyrene filling need to have a strong inner casing as these little beads get everywhere if there is a hole in the seam. 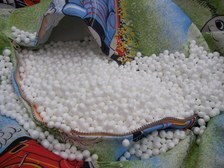 Care should be taken when filling the cushion to stop the inhalation of the beads. As you transfer the beads into your cushion or beanbag they seem to "come alive" with static and may cling to you so it is probably handy to have a vacuum cleaner ready to pick up any stray ones.